The 200-m (660-ft) long elliptical underground basilica of Saint Pie X at Lourdes, France, was completed in 1957. 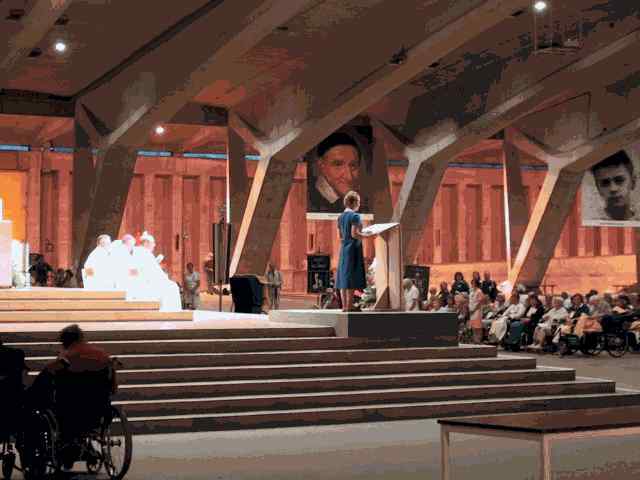 It was constructed, with a capacity of 30,000, for the International Mass that takes place on every Sunday and Wednesday when all the Pilgrims and sick in Lourdes join together in a unifying single act of worship. The building is in the form of an ellipse, the roof is in the form of an upturned boat and the centre point of the altar signifies that the Church the "barque of St. Peter" guided by Christ.